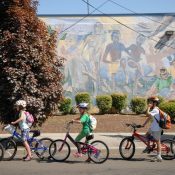 The Zoobomb Pyle—which Zoobombers call the “People’s Bike Library of Greater Portland”—is much more than a bunch of mini-bikes, it’s an icon that symbolizes one of Portland’s proud traditions. It’s also an important part of the weekly ride that zooms from the Zoo into downtown. The bikes in the Pyle are loaners which Zoobomb maintains for first-timers and others that show up without a bike. Unfortunately, there are lingering problems with the Pyle, and with growing pressure from PDOT, it seems change is inevitable. While it has the tacit blessing of many downtown cops and Commissioner Sam’s office, it remains a source of problems for both the city, at least one local business, and the gravity-loving group. According to the Zoobombers, the main problem is that “tweakers” often steal parts off the bikes. This makes the Pyle unstable and causes random parts to litter the sidewalk, raising safety concerns from PDOT. 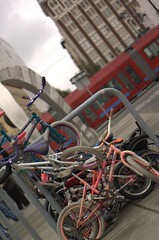 Parking crews have regularly tagged incomplete bikes and impounded them. To help relieve some of these issues, Zoobombers have started to move the Pyle every 72 hours from its traditional Rocco’s location (9th and Burnside) to right on Burnside in front of the aura Lounge, just south Powell’s (near the big needle sculpture, affectionately known as “the nutsack” by Zoobombers). Back in August, The Portland Mercury reported that aura’s GM Ron Mitchell complained about the Pyle in an email to Commissioner Adams. 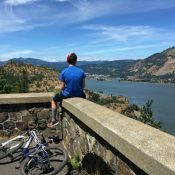 He said it interfered with the look of the public sculpture and that the bikes were “detracting from efforts to beautify Burnside.” He also blamed Zoobombers for vandalizing his property. 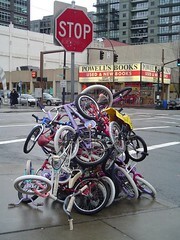 To solve these problems, Adams’ office—who respects Zoobombing as a “Portland institution”—has offered to work with Zoobomb to find a new location and even possibly help create a Pyle rack sculpture that would be sanctioned as offical public art through the Regional Arts and Culture Council (RACC). Last night, at a special pre-bomb meeting, the group discussed the issues and traded ideas. It seems that working with the RACC is a last-resort option for the Zoobombers. They have reservations about working with the RACC’s bureaucracy and jumping through all the hoops official public art status requires. 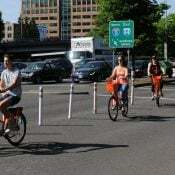 Instead, they are considering the creation of on an artistic, Zoobomb-themed bike rack, a process which must only be approved through a art bike rack committee within PDOT. 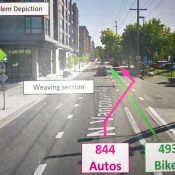 As for a new location, there was some excitement about moving the Pyle to Stark and Burnside (where it would have more visibility—and less theft—than the Rocco’s location). After the short meeting, it was time to Zoobomb! It was a gorgeous night on top of the hill, and despite my first Zoobomb crash (just a few scrapes luckily), it was a lot of fun. Just FYI, the $5 or ID collected is returned at the end of the night as collateral for the bike. Zoobomb is always Free99! Get the city to intall a couple of bike lockers. I think a custom rack would cost less. The rack I am proposing (several of us are coming up with designs) even bolts down where and existing bike rack bolts down. Also then it is the Zoobomb box not the Zoobomb pile.